Last week I spent a couple of days in Provence visting a (potential) customer. 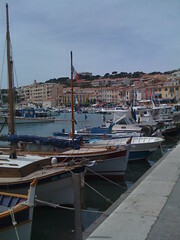 I stayed in the little village of Cassis to be precise; which is a pleasant little place though a bit of a tourist trap (ie. expensive but only half-decent food). If I’d been a bit more prepared I would have taken a real camera but unfortunately only had my iPhone (pictures on Flickr). Among the things I learned on this trip i) never transit through Philly again; ii) if you want medium-rare in Provence you have to insist on “burnt to a crisp” anything below that is just raw meat; iii) raw meat doesn’t agree with me; nor me with it; iv) The Mediteranean has Fjords; only they’re made from limestone and called Calanques.